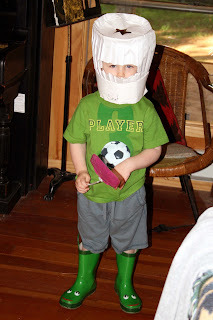 Yesterday, when I picked him up from school, he was running around the playground with a bucket on his head while brandishing a shovel. This behavior was tricky to explain. Actually, I sort of feigned ignorance. Does he have the playskool castle with all the little knights and the cannonballs? We had some fun with that plastic item, let me tell you. okay, so that's good, you're on top of that. How about the animated Disney classic, Sword in the Stone? And no offense, but a better knight's hat? I just think we could do a little better with that knight wardrobe.